The Australian Army’s customs and traditions represent the symbols and substance of much of our national character, adopted from Army’s forebears and developed since 1901 to where we are today. In the form of the ‘Rising Sun’, these traditions shape Army’s institutional values and to an extent its collective personality, which provides – along with serving members both past and present – the Army’s beating heart. Army’s foundations, exhibited through its customs and traditions, will ensure it continues to draw the pride and respect of the nation. Much can be learned from the past and Army constantly draws on the importance of its comparatively young but rich history. These origins have provided the forms for its badges, insignia and symbols of office; the way Army demonstrates respect for the past through formal functions and dinners, the way it addresses its people and the way they wear their uniform. These tangible links to Army’s past, like the weft and warp of a rich historical tapestry, set it up well for its furture. Just as Army respects its past, it and its people will respect it today and tomorrow. 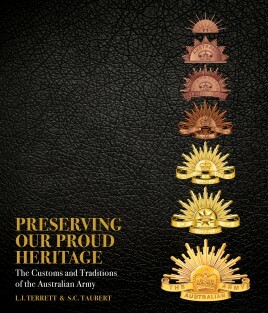 This thoroughly researched and beautifully presented full color edition of Preserving Our Proud Heritage: Customs and Traditions of the Australian Army includes a companion CD of the Australian Army’s Regimental marches and bugle calls, assembled together for the very first time.